Developed for the professional off-road racer, the BILSTEIN 9100 Series is truly state-of-the-art. The Standard Body is an extreme duty take-apart damper designed for off-road racing. Valving can be adjusted internally for rebound and compression. Developed for the professional off-road racer, the BILSTEIN 9100 Series is truly state-of-the-art. The Coilover offers the same damping features as the standard body shock with the ability to mount an external coil spring for load carrying capability. BILSTEIN does not manufacture or sell coil springs for off-road use. However, most BILSTEIN off-road retailers sell springs. They can also offer advice on spring rates. It is not recommended to use a coilover in conjunction with an auxiliary spring source, such as Leaf Springs or Torsion Bars. 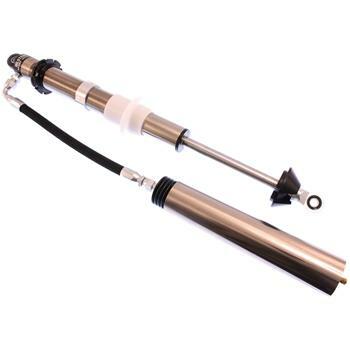 BILSTEIN 9100 Series External Bypass Shocks were developed for the professional racer, and are truly state-of-the-art. It is an extreme duty, take-apart monotube damper designed specifically for off-road racing. External Bypass dampers require an external spring source such as a coilover, leaf spring, torsion bar, or auxiliary coil. These dampers will not support a vehicle. Designed for the rapidly growing rock crawler market the 9100 Series Rock Crawler features BILSTEIN’s industry leading technology and the experience gained in decades of off road competition. The BILSTEIN Bump Stop improves suspension performance with more up-travel impact control and durability for off-road racing vehicles and prerunners.